● Once, while this card is face-up on the field: You can place 1 Spell Counter on it. This card gains 300 ATK for each Spell Counter on it. You can remove 1 Spell Counter from this card, then target 1 monster on the field; destroy that target. 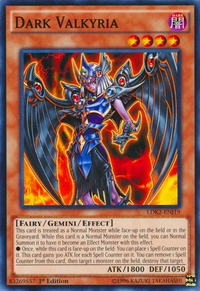 This is the Dark counterpart of Dunames Dark Witch and Power Angel Valkyria. This is strengthened by the fact that the Japanese name of Dunames Dark Witch literally translates to Dunames Valkyria. This is the only Dark counterpart that is also a Gemini monster. Interestingly despite being Dark counterpart of Dunames Dark Witch, her outfit has a notable differences in both the skirt and chest armor. While "Dark Valkyria" is an Effect Monster, you can place Spell Counters onto it with other card effects, like "Pitch-Black Power Stone" and "Apprentice Magician." 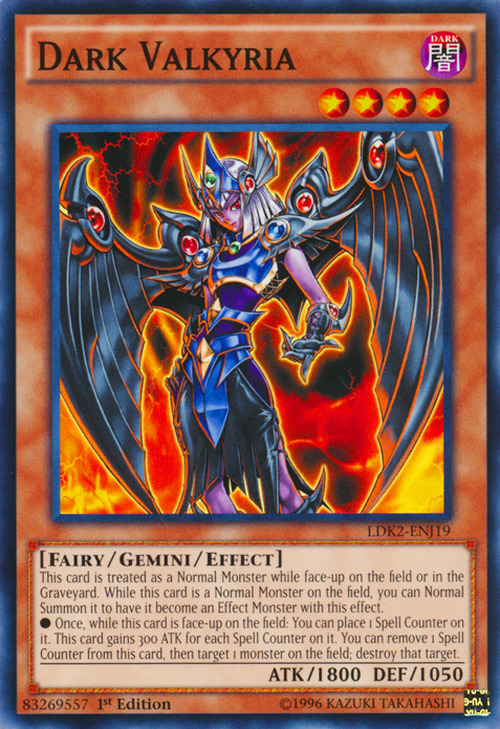 If "Dark Valkyria" is treated as an Effect Monster due to the effect of “Superalloy Beast Raptinus” and has a Spell Counter when "Superalloy Beast Raptinus" is removed from the field, the Spell Counter is removed because "Dark Valkyria" is changed to a Normal Monster. If "Dark Valkyria" becomes an Effect Monster again afterwards, its effect can be used once more.